Dr Stefano Sconci, founder of Sconci Art Gallery in Rome, has been interested in the work of Arab artists ever since he opened the gallery in 1977. He has in his collection seminal works by well-known Arab artists such as Fateh Moudarres, Hussein Madi and Abdullatif Al Smoudi from the period when they were studying art in Rome. 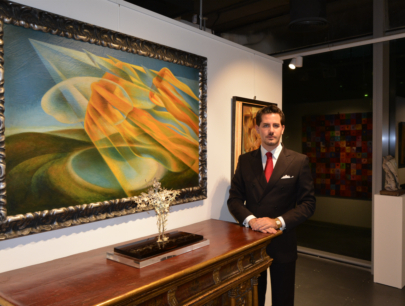 Now, Sconci’s son Dr Lorenzo Sconci is taking this connection with the Arab world further by opening a branch of the gallery in Dubai. Located in Dubai Design District (d3), Sconci Art Gallery is the first Italian art gallery to open in the city. To celebrate the opening of its Dubai space, the gallery showcased more than 70 significant works from its collection in an exhibition titled “A Charming Vision: An Embrace between East & West” in November last year. The artworks included modern and contemporary Italian and international paintings and sculptures, some historic Italian paintings in original frames, and 16th century Milanese furniture. Highlights of the show included key works by important artists of the Futurism movement in Italy, such as Roberto Marcello Baldessari’s “Speed on the Lake” from 1932 and Pippo Rizzo’s 1921 painting, “The Knife Grinder”; noted Italian pop artist Mario Schifano’s well-known work from 1994 “I’m Infantile”, created in collaboration with school children; a silk print by Andy Warhol with a rare double signature; Russian artist Alexander Brovin’s painting “Babel’s Tower”; intricate silver sculptures by Italian master Anna Salvatore; Michela Zasio’s evocative paintings of palm trees; mixed media works by Luca Valentini, who juxtaposes images of icons such as Gandhi and Mohammad Ali with popular comic characters to convey the spirit of the times; and “My Dubai”, a monumental 2015 painting by Giuliano Giganti that captures the energy, dynamism and optimism of Dubai. Displayed alongside were early works by the Arab masters, such as Moudarres’s 1961 painting “Pain”, which expresses his feelings about the death of his child; “Arabic Table”, a still life by Madi from the 1960s, and early paintings by Al Smoudi. Although he studied law, Stefano Sconci fell so much in love with art after seeing his aunt Anna Salvatore’s work that he changed his career. “I began by organising her exhibitions, and tried to learn as much as I could about classical and contemporary Italian art by visiting museums, exhibitions, reading books and meeting artists, critics and collectors, before opening Sconci Art Gallery in Rome,” he says. Why did you decide to open the gallery’s first space outside Italy in Dubai? I have always been interested in art, because since childhood I have been accompanying my father to auctions, exhibitions and artists’ studios and have grown up surrounded by art. A few years ago I came to Dubai for a short holiday and saw the developing arts scene here. While researching the market, I realised that the people from this region already have a good appreciation of Italian food, fashion and art because they often travel to Italy, and they visit not only famous tourist cities, but also smaller, lesser known Italian towns. I felt that this would be the ideal place to introduce key Italian artworks to the exciting art market in the region. My father supported the idea, and as artistic director of the gallery, he will help me to organise high quality exhibitions here. Why did you decide to be in d3? We wanted to be in a dedicated design environment, which is also the heart of the design world in the Middle East; and rather than a warehouse, we wanted to have a luxurious, elegant Italian concept, with minimalist interiors that keep the focus on the art. What is your vision for the gallery? Italy is famous all over the world for its history, culture and art, and our aim is to represent Italy, and become an important reference point for art lovers and collectors from the UAE and the gulf region, as well as people from the rest of the world who live here. We want to gain their respect and trust by providing a continuous, interesting, exciting and particularly new artistic proposal compared to those of other galleries in Dubai. We want to honour the strong cultural ties between Italy and the Arab region by showcasing works by important Arab artists from our collection, and providing a platform for local emerging artists. What kind of exhibitions will you host? Our collection includes a wide range of works of art from the 17th century to the present day. We offer modern and contemporary art that will appeal to collectors and art enthusiasts of all levels. We have works by established artists, who are sought after at international auctions; artists who are well-known in their own countries, but who do not want to enter auctions and public sales; and young artists of various trends, schools and movements that are growing in reputation. As a first step, we want to understand local tastes and trends, hence for our debut show we decided to present a large collection that gives a wide overview of works by reputed artists that we have been following for a long time. We are also exhibiting artworks from Fabrizio Gunnella, who is known for his portraits of celebrities such as Luciano Pavarotti, Maria Callas and Mother Teresa. In recent years the artist’s style has evolved from figuration to abstraction. He produces very few works, and all his recent works belong to us. We are very happy to present these rare works in Dubai. In March, we will present a solo show by Massimo Onnis, and the artist will be in Dubai for the opening. In the future we want to organise solo exhibitions of modern and contemporary masters as well as emerging artists. We will also organise thematic shows dedicated to ancient art and to the great art movements of the 20th century, such as Futurism and Post War Avant Garde that has been a source of inspiration for all successive artists. During our exhibitions, we will invite artists and well-known art critics to participate in talks and discussions. In the future, we also want to organise art auctions.